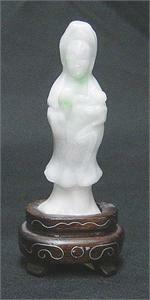 Item #S-300: 1.5"x3.25" tall Natural White, Green and Lavender Burmese Jadeite Beauty. Mounted on .75" tall wood stand. 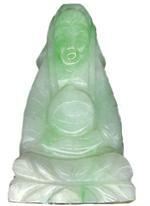 Item #CJ-2094: 1"x1.625" tall pale Green Burmese Jadeite Kwan Yin Minature with dark Green mottling of 20.94 Gms. Mounted on Lucite stand. 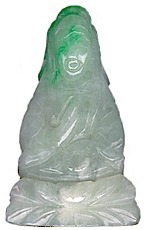 Item #JP-171: 1"x1.5" tall pale Green Burmese Jadeite Kwan Yin Minature with dark Green mottling of 17.00 Gms. Mounted on Lucite stand. Item #GS-2169: 2"x4.75"x2.5" tall Burmese Jadeite Rhinoceros. Item #GS-662: 2" diameter pale Green Burmese Jadeite Rooster Plate. Mounted on 1" tall wooden base. Designs vary. 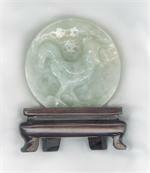 Item #GS-243: Carved Burmese Jadeite Screen; approximately 5"x7" tall and 10mm thick on wooden stand. Item #GS-463: Carved Burmese Jadeite Screen; approx. 5"x7" tall and 10mm thick on wooden stand. Item #GS-2117: 1.25"x2.75"x1.25" tall Jadeite Buffalo mounted on .75" tall wood stand. Item #GS-2131: .75"x2.25"x1.25" tall Jadeite Goat. Item #26: 3.5"x7" white and green Jadeite gourds and crickets on wooden stand.